Removing a load-bearing wall and replacing it with a beam is significantly different from removing interior non-load bearing walls. Load-bearing walls are structural elements that help support the weight of the house. Non-load bearing walls, also called partition walls, do not support loads from above and are simply there to divide spaces. 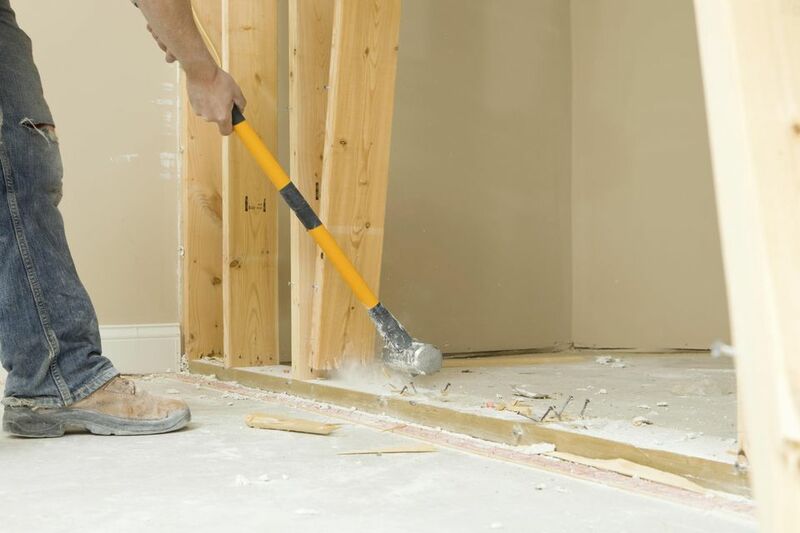 If you're considering removing a load-bearing wall—whether you plan to do the work yourself or hire a contractor—there are some core issues you must address first. While a majority of homeowners choose to hire a contractor for this heavy project, in most communities, permitting authorities will allow homeowners to do the work. And they must adhere to the local building code requirements and pass inspections, just like a contractor would. Since all municipalities are different, check with your local permitting authority or building department for guidance. Local permitting authorities usually have a hand in all aspects of home remodeling―fences, walkways, decks, ponds, wiring and plumbing upgrades, and structural changes, such as load-bearing wall removal. Most of these projects require a permit and inspections. It should come as no surprise that your permit agency wants to know if you are taking down a wall that affects the structural integrity of your home. You may even need to submit a detailed plan regarding an alternative support system. Large walls may require an architect's drawing and/or an engineer's stamp of approval. If you take something out, it must be replaced. To see how this works on a small scale, consider your home's windows. Walls are the best way to hold up a house; cutting a hole in the wall can only compromise this. But window headers―basically small beams―serve to replace the removed portion of the wall framing. Beam only: A horizontal structural beams of sufficient size. Other than the two ends, the beam has no vertical bearing points. Beam and post: A horizontal beam that is with one or more intermediate posts between the two end bearing points. You cannot just grab a 4x4 off the shelf at the local home center and use it as your sole carrying beam. You may be able to use solid lumber, such as a 4x6, 4x8, or 4x10, or you can sandwich two (or more) 2x10s or 2x12s together (sometimes with a layer of 1/2-inch plywood in the middle) to create a "built-up" beam. But a better idea is to order a laminated veneer lumber (LVL) beam. LVLs pack greater strength into a smaller space than similarly sized dimensional lumber. Thus, a 4x6 LVL will be stronger than a single piece of 4x6 dimensional lumber. That said, you may be surprised that LVLs are not very expensive. Architectural LVLs are expensive because the wood is meant to be viewed, not covered up with drywall. Non-architectural LVLs are dramatically cheaper than architectural versions. In most cases, the replacement beam will be lower than the height of the ceiling. This is because the floor structure above rests on top of the beam. Alternatively, to make the beam flush with the ceiling, you have to cut back the floor joists above and set the beam into the plane of the floor, then hang the ends of the joists from the sides of the beam using metal joist hangers. This requires considerably more work than simply replacing the load-bearing wall with a beam below the joists. Intervening vertical posts (or columns) under a carrying beam admittedly do take away from that flawless open floor plan look. However, any kind of vertical support you can add under a horizontal beam will give your beam assembly far greater strength. Additionally, if you are having issues with the beam protruding too far below ceiling level, posts can allow you to get by with a smaller, and thus less protruding, beam. Span tables are readily available but are hard for the layperson to read. If it were as simple as taking a few factors into account―distance spanned, one- or two-story house, type of house, etc.―we would all be structural engineers. But there are more factors to take into account, like deflection, shear, dead weight vs. live weight, and roof loads. This makes beam sizing difficult for the amateur. A structural engineer or contractor can consult with you on the proper size of the beam. Some structural engineers may agree to work on a per-hour basis. Before removing any part of a load-bearing wall's framing, you must build a temporary support wall on both sides of the load-bearing wall. This is because the floor joists above may have their ends resting on the load-bearing wall. If you add temporary support on only one side of the wall, the joists on the other side may not be supported. Well-built structures are constructed with redundancy in mind. Even when a major structural element such as an internal load-bearing wall is removed, the rest of the house may stay more or less intact. You see this often after a tornado or earthquake, where two-story houses have entire exterior walls ripped off yet the building remains standing. The reason for this is redundancy. Even with the wall removed, a host of other interwoven elements, both structural and non-structural, pull together to keep the overall structure intact. When the wall comes out, flooring, subflooring, underlayment, neighboring walls, joists, rafters, and many other elements, come into play to hold the structure intact. However, gravity will slowly take over and the house will begin to sag and slump. This should not be construed as an encouragement to remove load-bearing walls without a beam replacement; quite the opposite. It is a reminder that you should not be lulled by the power of structural redundancy. Gravity will win. It is just a matter of how fast this happens.